you will savor each dish one by one. 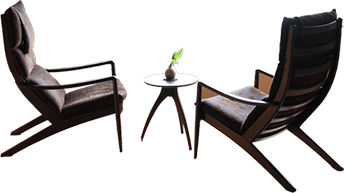 Hospitality, four aesthetics integrated into one. and space come together and offer the ultimate hospitality. 1. Charm of service We serve the dishes while looking ahead the flow of food so that you can enjoy the hot dishes while they are hot and cold dishes while they are cold. We have refined the close teamwork of chef and customer service and we offer meticulous service that makes the food even more delicious. 2. 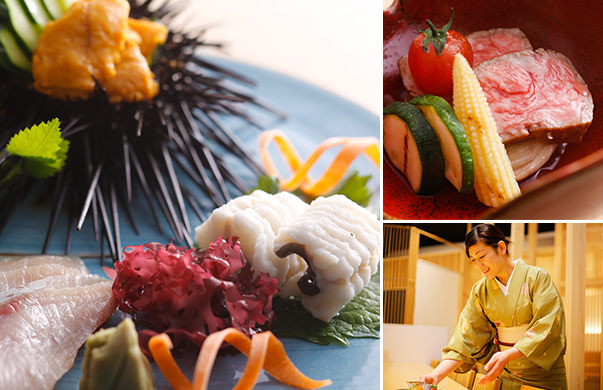 Charm of Cuisine Luxuriously enjoy the seasonal local “Delicacies” Our dishes are carefully prepared by experienced and skillful master check mainly using fresh ingredients of Awaji Island. Out dishes are prepared with effortless and careful work and the have the fine balance of tastes like sweet, sour, and bitter, and they bring out the inherent flavor of seasonal ingredients to the maximum extent. full justice to the cuisine Serving dishes that are just simple and serving dishes that give a beautiful look to food are two different things. 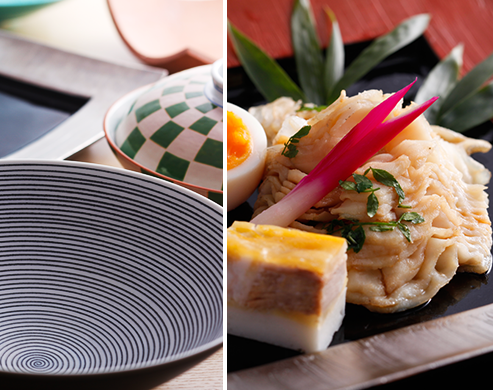 In order to do justice to the entirely creative Kaiseki meal prepared by the master check, we have prepared serving dishes with novel color emotions that transcendence the limit of Arita ware. 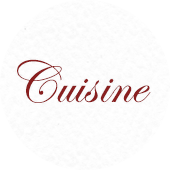 They give excellent luster to the carefully prepared food served in them. with the flavor of wood Feel the warmth of wood and on the other side of counter which is neat and clean, you will find the expanse of massive orange clay walls prepared by the master workmen of Awaji. 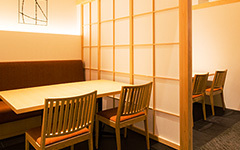 Space here emphasizes the cuisine itself or the work of check, and dishes render a relaxing time in a luxurious manner. For just one word that everything was “Delicious”. 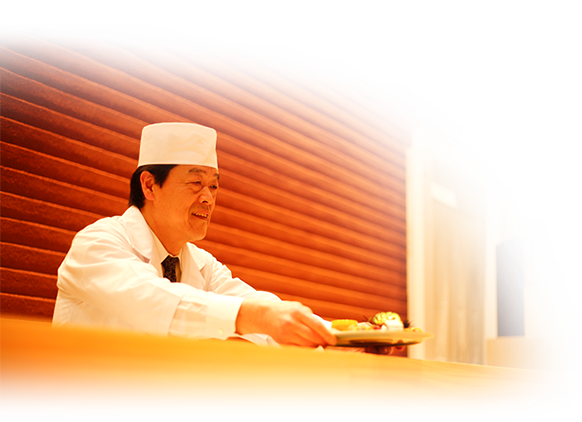 One request that we have received from several customers over many years is that they “Want to relish the authentic Kaiseki meal”. Over more than a year, I continued to looking for the answer by repeating the trial-and-error while saving the Kaiseki meal all over Japan. 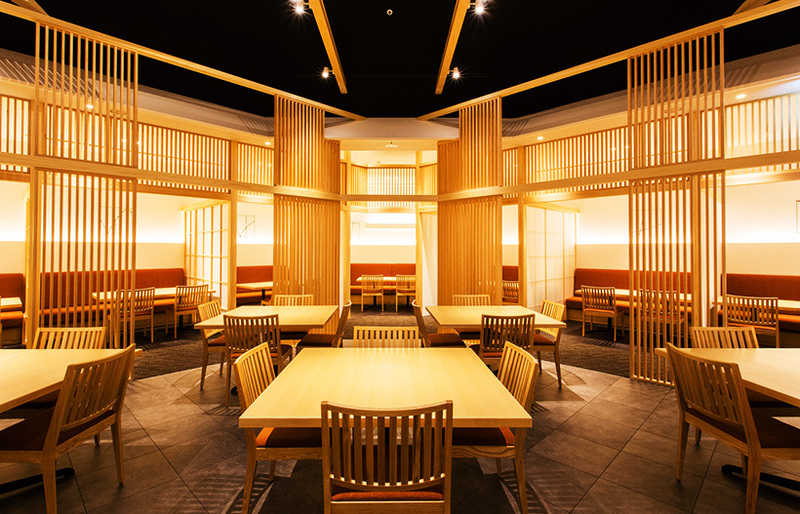 Finally, after remodeling the dining space and complete makeover of the service, I created a system that would offer cuisine, serving dishes, space, and service suitable for the authentic Kaiseki meal. This was for just one feedback from the customers that everything was “Delicious. Please do enjoy the hospitality of “four charms integrated into one” achieved by the ultimate marriage. following are the specially select dishes by our master chef. Yolk in soy sauce prepared by dipping yolk in sashimi soy sauce for few days. It has a unique sticky feel. 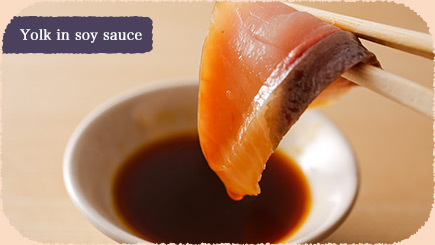 Mellow and concentrated taste brings out fresh sashimi flavor. 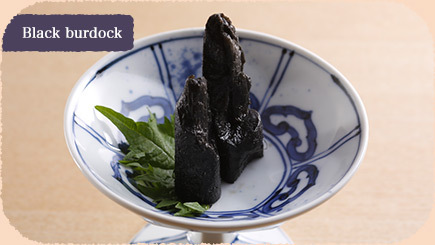 Burdock is carefully cooked for two and a half day for removing its harshness. As a result, it gives back finishing. This is one of the dishes that we confident about where careful work of our master chef is evident in the form of black tinge of burdock. 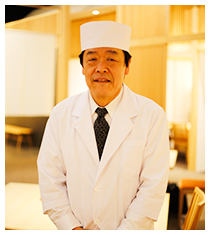 Our restaurant is the “Main Dining Yura” that was refurbished in June 2013. In the interior where you would feel the warmth of wood, enjoy your meal while savoring relaxing and enriching time. Soothing and relaxing time The joy of travel is more than anything a relaxing bath where you fully stretch yourself. 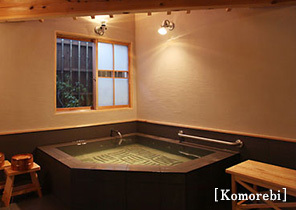 After fully enjoying Awaji Island, relax in a huge bath. 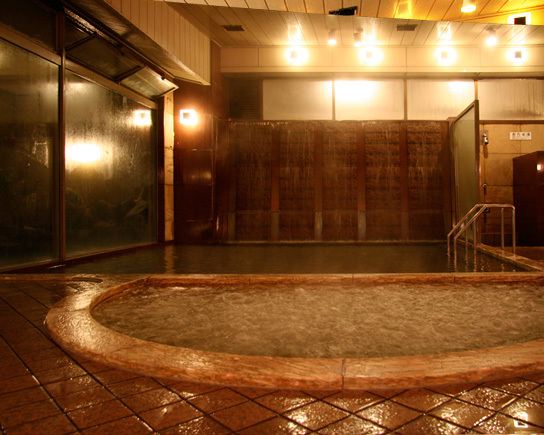 Have soothing and relaxing time in the hot water of Sumoto Hot Spring, Awaji Island. start time of using “Harusame” is from 15 minute of each hour. 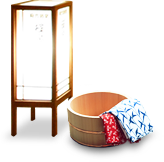 ※Start time of using “Komorebi” is from 30 minute of each hour. 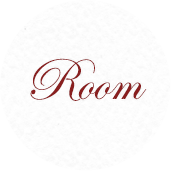 ※This facility is available only for the guests staying at the hotel. 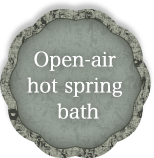 Open-air hot spring bath is a dynamic bath tub with a beautiful combination of large rocks. 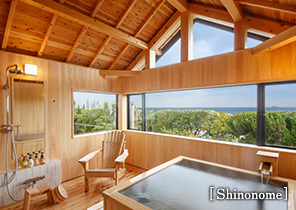 You can enjoy the hot spring while sensing the air of Awaji. More than anything, the ultimate joy is a relaxing Large bath where you can fully stretch yourself. 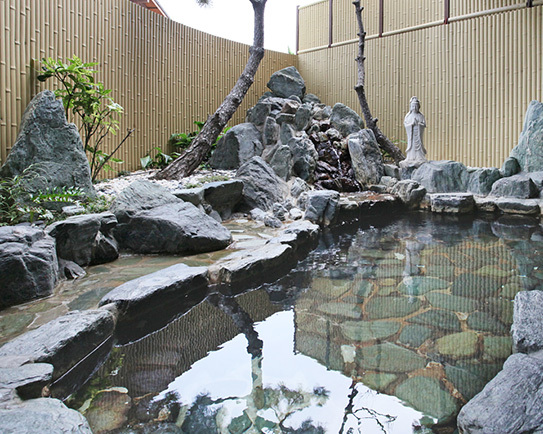 ※Reserved hot spring for private use is only available for the guests staying in the hotel. All rooms are ocean view rooms All rooms are ocean view rooms with 180° panorama view of ocean. We receive exclamatory feedback from all our customers for view from the room. Just watching the continuously changing the surface of ocean heals the mind and hard.